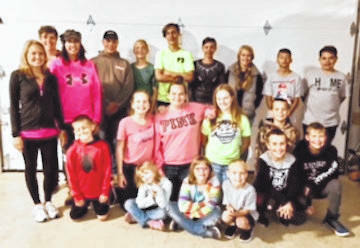 The Next Generation 4-H Club had a post-fair get together on Sunday Sept. 9. It was a potluck dinner, we played some games, and everyone talked about the fun things that they did at the fair. We have a growing club and every year we gain more members. This picture is does not include everyone as some were not able to make it. Club members took projects from pocket pets and sewing, to chickens and goats, and just about everything in between. There were many ribbons won and lots of proud moments. Great memories are made year after year and I’m proud to be a part of this club. Our club advisors are Missy Kidwell and Robin Jordan. For information about joining 4-H contact the Morrow County Extension Office at 419-947-1070.